Herbs are often thought of as a garnish and many recipes only call for a small serving. Unfortunately, herbs are often sold in portions that are larger then needed and usually end up spoiling before being used. It is the health version of the hot dog and bun dilemma. However, tabbouleh may be the culinary answer to preventing the waste of these edible gems. Herbs are one of the main ingredients in this classic Mediterranean dish which allows for their distinctive flavors to be showcased. Another advantage to increasing fresh herbs in the diet is they are rich with disease fighting micronutrients that are not often provided in large doses. Many of the phytochemicals found in herbs have been linked with anti-inflammatory pathways and therefore have powerful medicinal properties. 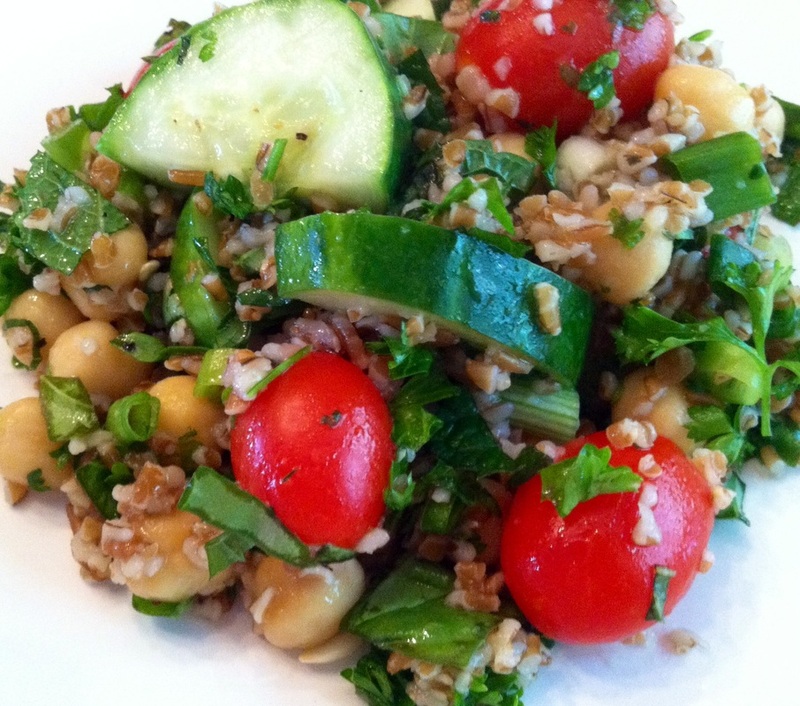 Making a large batch of tabbouleh allows for the incorporation of herbs that may not otherwise find a dish to call home and increases the intake of unique phytochemicals. This recipe calls for other plant based ingredients that also increase the nutrient value of this dish. Although not customary, garbanzo beans are added to increase the protein and fiber content. This allows for this meal to be filling and satisfying. Tomatoes provide color while the green onions add heat to this flavorful and biologically favorable meal. So when you find yourself with an excess of fresh herbs put them to use and enjoy both their bright flavors and nutritive power. Directions: Cook the whole grain according to the packages instructions adding the beans to the water as well. While the whole grain and beans cook wash and chop the produce. Cut the cucumber in half and then into smaller pieces to make the size of the vegetables more uniform. Leave the cherry tomatoes intact to prolong their freshness. Add all the produce to the mixing bowl. When the water has evaporated from the pan add the whole grain and beans to the mixing bowl as well. Next add the salt, pepper, olive oil and lemon juice. Stir to combined. If you would like more flavor add more lemon juice right before you serve the dish.